Gilleland et al. (2015) have just published a paper in GENETICS in which they describe CAMI – a Computer Assisted Micro-Injection platform that they created to streamline the production of transgenic C. elegans. The reasons for creating such a system and some of the technical problems they had to overcome very much parallel what many insect biologists are currently facing and consequently, their work could be of interest to insect biologists. 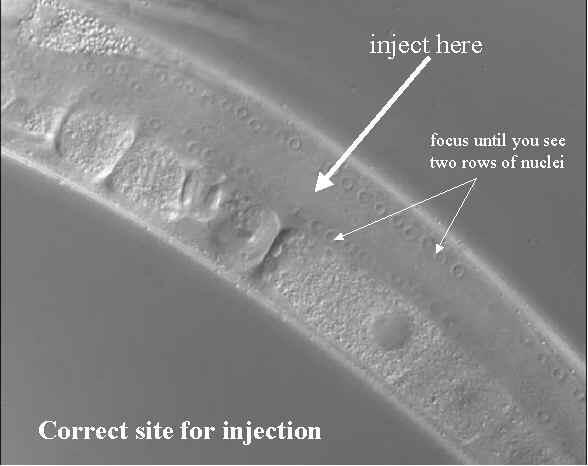 Injecting C. elegans gonads is not much different nor more difficult than injecting insect embryos. Worms need to be immobilized and prevented from desiccating while being manipulated during the injection process. In this case Gilleland et al. use a trick first reported by Hwang et at. (2014) in which a hydrogel is used to immobilize the worms without killing them. Pluronic acid is liquid at low temperatures but solidifies at higher temperatures. Gilleland et al. placed a number of worms on a glass slide in a mixture of chilled pluronic F-127 hydrogel (25%) and 10mM sodium azide as an anesthetic and allowed to settle so they are in the same optical plane. Once the animals have settled the glass slide is heated to 25 C causing the gel to quickly harden and immobilize the animals. The gel concentration was stiff enough to immobilize the worms while letting the injection needle travel through the gel without bending. After injecting the worms, the hydrogel can be dissolved to release the animals. Temperature dependence of Pluronic acid. Automation was accomplished using a high-speed camera, a robotic XY stage, temperature control, micromanipulators and a piezoelectric driven needle with pneumatic control for dispensing the needle’s contents. Basically the computer locates animals and locates the gonads with each animal. It does this for each animal on the stage, making a map and plotting the best route from animals to animal. This is all done at fairly low magnification. With targets acquired and mapped, the magnification is increased and each gonad is revisited and injected by a user command after which the next target is visited. Minor adjustments in positioning, if needed, can be made by the operator. The system operates at about 25 seconds per gonad. Gilleland et al. demonstrate the efficacy of their system by performing a set of multiple injections using multiple vectors. The system required about US$100,000 worth of hardware and therefore would not be for everyone. However, some of the technical aspects of their system such as the use of hydrogels for immobilizing injection targets and managing dessication, and the piezoinjection system could be broadly useful to insect biologists struggling with ‘delivery’ of genetic technologies.